The African bullfrog, also known as the pixie frog due to its scientific name, is the largest known amphibian in southern Africa. These amphibians are quite resilient— they can withstand some of the harshest weather conditions imaginable. During the dry season, they stay underground in chambers that they excavate using horny tubercles on their hind feet. At this time, the African bullfrog enters estivation in order to conserve energy. Similar to hibernation, estivation is a state where an animal becomes physically inactive or dormant, often appearing to be in a deep sleep. When the dry season is over and the rainy season begins, the African bullfrog inhabits seasonal bodies of water, where it spends its time breeding and eating. 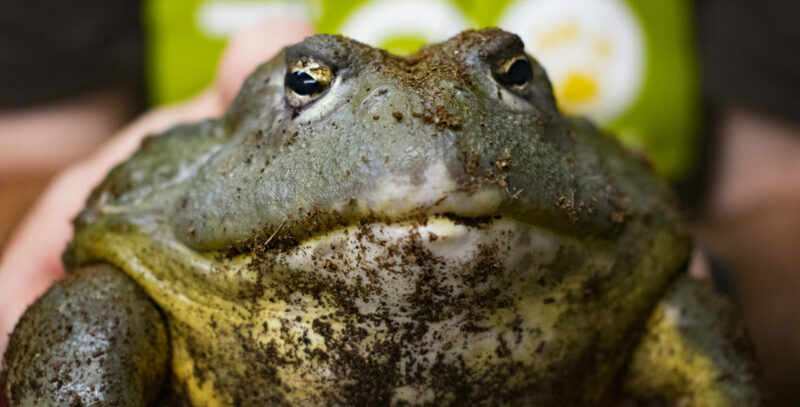 The female African bullfrog can produce 3,000-4,000 eggs that will develop into tadpoles in just two days!